Cold weather is something football fans look forward to during the NFL playoffs each and every year. Whether it's the infamous tuck game or The Ice Bowl, frigid temperatures go hand in hand with playoff football. And with the Kansas City weather forecast already impacting the over/under as the temperature at kickoff continues to go down, so does the total. Here's part of the reason why. The AFC Championship between the Patriots and Chiefs has an over/under of 54.5. No NFL game with temperatures below 24 degrees has ever finished with a total of 50 or more. The temperature in KC on Sunday evening is projected to be as low as 15 degrees. As long as it's under 24 degrees, which is almost a given at this point, history says there won't be more than 50 points scored when the Patriots and Chiefs take the field on Sunday. And this isn't a small sample size. It's never happened. ​These two offenses will try to do something that has never been accomplished in the history of the NFL – 50-plus points when it's 24 degrees or less. 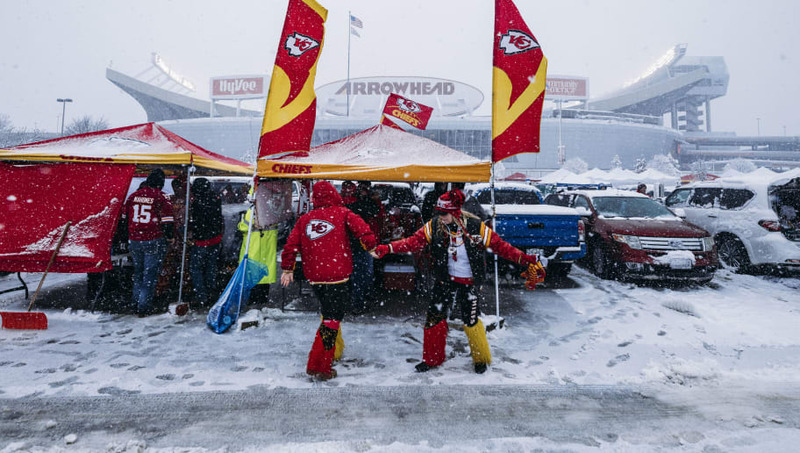 "Arctic blast" is expected for Sunday night's #Patriots #Chiefs game at Arrowhead with temps in 0-10 range. And in that same game, bettors should be excited by Tom Brady's career record in cold-weather games as the five-time Super Bowl champion thrives when it's cold outside. Whether the Chiefs and Patriots offenses thrive too remains to be seen. But history says don't bet on it. ​Join FanDuel Sportsbook Today. New users get a risk-free bet up to $500. Join Now.